One of the fastest ways to make money in the market is by trading options. It's not a secret any longer. Options allowed educated investors to leverage their money, protect their portfolio, or speculate on stock and market movement or events. That's why option volumes have risen almost 500% in less than ten years. In 2008 the CBOE reported an annual volume of more than 1 billion contracts traded. 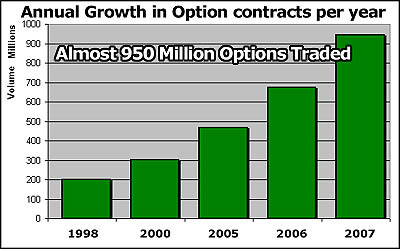 Through April of 2009 over 1.18 billion contracts traded across all exchanges. You can see that more and more investors and traders are turning to options to capitalize on fluctuations in the stock market. Since 1997 the Option Investor Newsletter and website has been a leader in providing individual investors with effective option trading strategies. We've also garnered quite a reputation for some of the best option trading education available. Currently the markets are in turmoil. Venerable Wall Street firms and massive hedge funds are vanishing from the financial landscape. Fundamental investors are drowning as markets ricochet between fear and greed. In the 21st century markets are faster and stocks are more volatile. Independent traders need all the tools available to make informed, profitable decisions. The Option Investor Newsletter can be your must-have tool to out perform the market and help take your results to the next level. Trading options is not for everyone. Investors who are willing to explore the world of option trading can find a wealth of strategies. Our newsletter can show you how to profit in both up and down markets. The combination of experienced big-picture acumen, technical analysis, and constant observation on the stock market boil down to our one goal of generating money-making insight and strategies for our subscribers. The Option Investor Newsletter will help you make more educated trades while minimizing your risk with clear buy and sell signals through our published entry, exit, and stop loss recommendations. In today's market investors need the Option Investor Newsletter now more than ever! Sign up today for your free trial. The Option Investor Newsletter is more than a website. It is your portal to a suite of trading newsletters. Investors looking for new ways to maximize their potential can choose from a variety of specialized strategies and focused commentary. For more information on each newsletter click below. Option Writers - Another perspective on selling options for a profit. Covered Call System - Using this traditionally conservative option strategy to its maximum benefit. Market Monitor - Your Real-time, live-action, window-on-the-market feed for active traders. Couch Potato Trader - How to use a delta-neutral (market neutral) approach and more to make consistent returns. Premier Investor - A simple, straight-forward buy here and sell there stock selection service for short-term to long-term investors.